I have worked with too many interns who came into the experience without direction, objectives or focus. They didn't know what they wanted to get out of their internship. That, my friends, is a mistake. Internships are about more than just getting college credit. They help you establish habits, learn tangible career skills in a contextual setting and create a network that can be a springboard for a successful career. 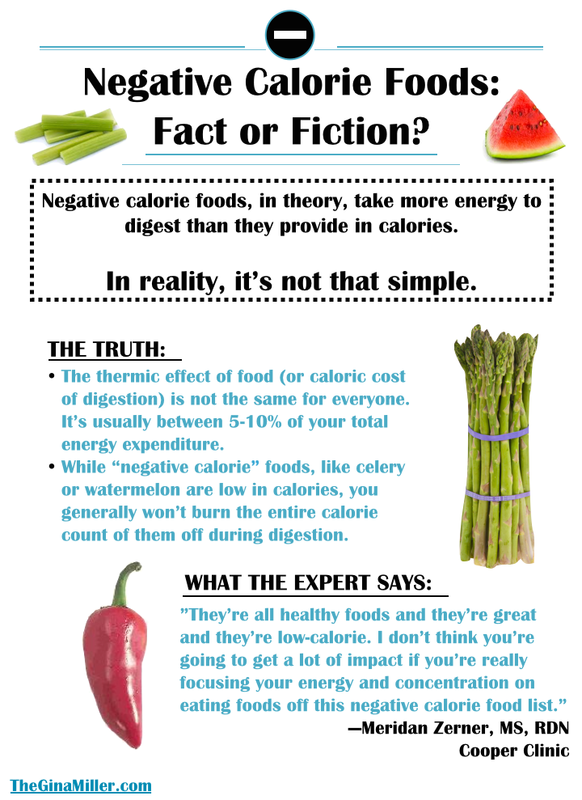 Negative Calorie Foods: Fact or Fiction? Are there really miracle foods that are negative in calories? In theory, yes. In reality, it's a bit more complicated. 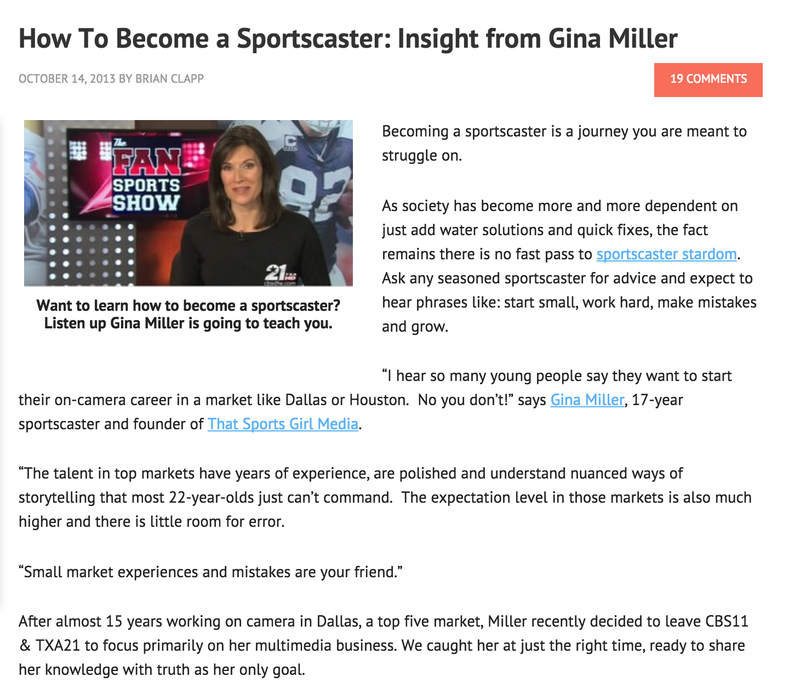 I am often asked about becoming a sportscaster. 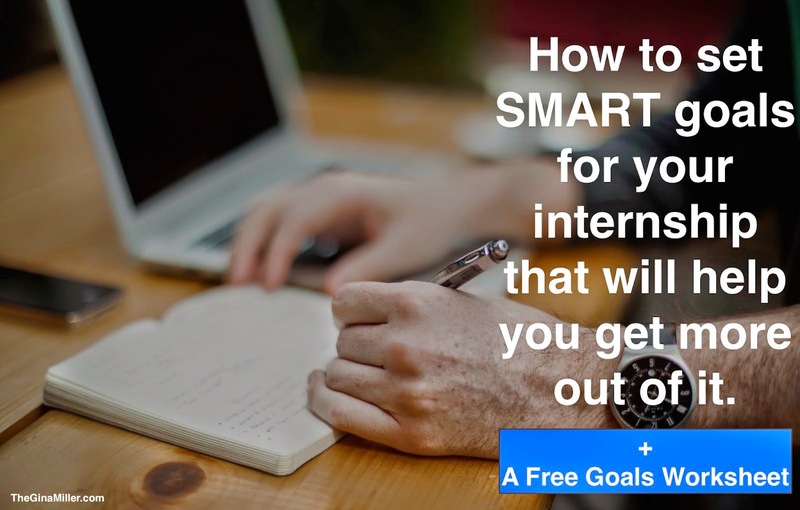 From breaking into the industry to creating a demo tape, I receive hundreds of email a month from young professionals looking to enter the business as well as mid-career professionals wanting to purse their dream careers. This interview I did with WorkInSports.com's Brian Clapp let's you inside the virtual locker room to share what a sportscaster's career narrative is really like. In short it's fun, exhilarating, exhausting, frustrating, rewarding and challenging. It's a lot of things, rolled into one. It's also a career that requires multiple talents and an open mind. "14 Things You Need To Know If You Want To Work In Sports Media"
"What It's Really Like Being A Lady In The Locker Room"
You can also watch my Google Hangout in the box below. I believe in the value of internships. Unfortunately, too many young professionals don't take advantage of that experience. I am putting the finishing touches on a guide that offers advice to help you (or your kid) do just that: maximize the internship experience. It features advice like this: "10 Mistakes To Avoid Making During Your Internship". Want to be the first to know about the book launch AND cool internships, like these? Sign up for my internship newsletter. I'll send you career advice, amazing internships opportunities and details on my upcoming internship book. Have a question about anything mentioned in this story? Leave a note in the comments section. Know someone who could use this? Please pass it along. While certain foods are packed with vitamins, antioxidants, minerals and healthy fats they also contain carbs and calories. 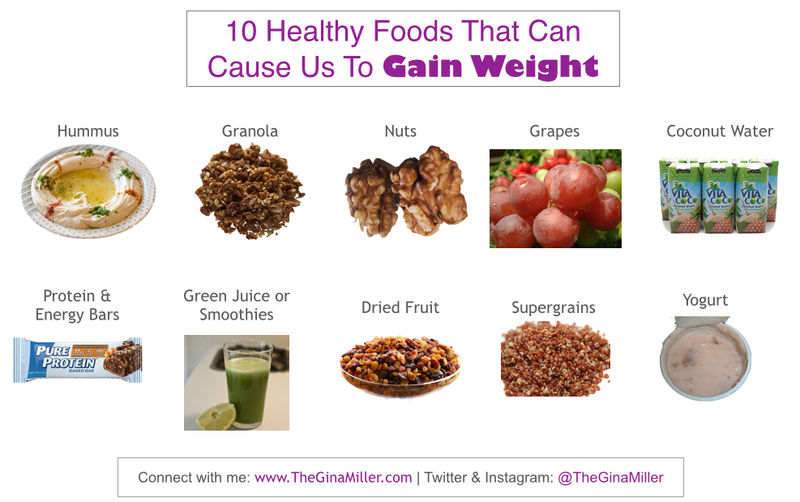 No matter how healthy, if you eat too much that can lead to weight gain. With graduation only a few months away, this is the time of year my inbox fills with requests from students (and parents of students) who want help, insight and guidance on landing a job or internship in sports media. Get More Sports Media Internship Advice AND Insider Access To Cool Internships! Click HERE To Visit The Internship Section on Gina Miller Media. Truth be told, it's one of the most exciting, challenging and downright fun career paths anyone can choose. You're covering games. You're interviewing All-Stars. You're traveling around the country, many times the world, to attend sporting events. You're doing things stuck-in-their-cubicle 9-to-5ers only wish they could do. Indoor sky diving with the Dallas Cowboys? Flying on a billionaire's private jet to watch his favorite football team play? Touring NBA players' mansions? Done. Done. And done. It's the coolest of cool jobs. But it's not all jets, games and glam. A career in sports media requires more than just a passion for your favorite team, reading ESPN and trolling Twitter. It's work. Hard work. It also takes a fair amount of resilience because you will make mistakes, you will get criticized and you will get scooped on a story. I have learned a lot during my sports media career which started in 1994 as a media services intern with the Houston Rockets and included stops in Guam, Knoxville, my hometown, Dallas and most recently Los Angeles. From truths about myself and the nature of individuals considered icons to the rhythms of a season and how to pose a question after a terrible loss, sports media is very much a business about people and relationships. To that end, there are certain things you should consider if you want a career in this industry. I have spent a small fortune on good lip balm. No mas! I finally found a lip balm that hydrates and lasts: Nuxe Rêve de Miel Ultra Nourishing Lip Balm. Made by the legendary French skincare company, (which is now available at Target!) this lip balm is a honey-based product that truly does moisturize. Even better? You don't have to continually reapply like you do with Carmex or other lip balms. I bought this in Paris last November for about €12 or ($13.23 at the current exchange). It retails for $19 in the US but is worth it, IMO. 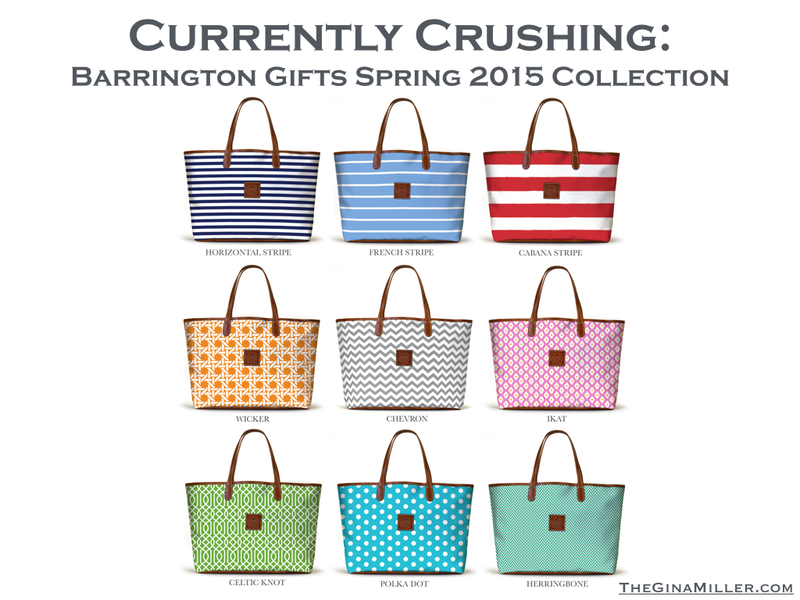 I have a thing for Barrington Gifts. 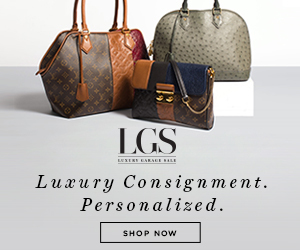 The Dallas-based company allows you to customize their bags, accessories and gifts so that your piece is a true reflection of your personal style. Their Spring 2015 collection is on-trend yet timeless featuring a vibrant palette of colors and an updated selection of fun patterns. This blog post has moved over to my new website, FabFrenchFinds.com. Click HERE to read this story. Perhaps it's because I have a tried a slew of fad diets (and failed) but I love diets. I enjoyed learning the history of them, the science behind them, the failure rate behind them. You get the idea. There's even a fun, new book by New York magazine writer Rebecca Harrington chronicling her adventures in celebrity dieting titled "I'll Have What She's Having, My Adventures In Celebrity Dieting". This book is heaven for a diet lover like me. The LA Times had a great feature this weekend on the history of fad diets, starting all the way back in 1825 when French gastronome Jean Brillat-Savarin introduced a low-carb regime called "The Physiology of Taste". 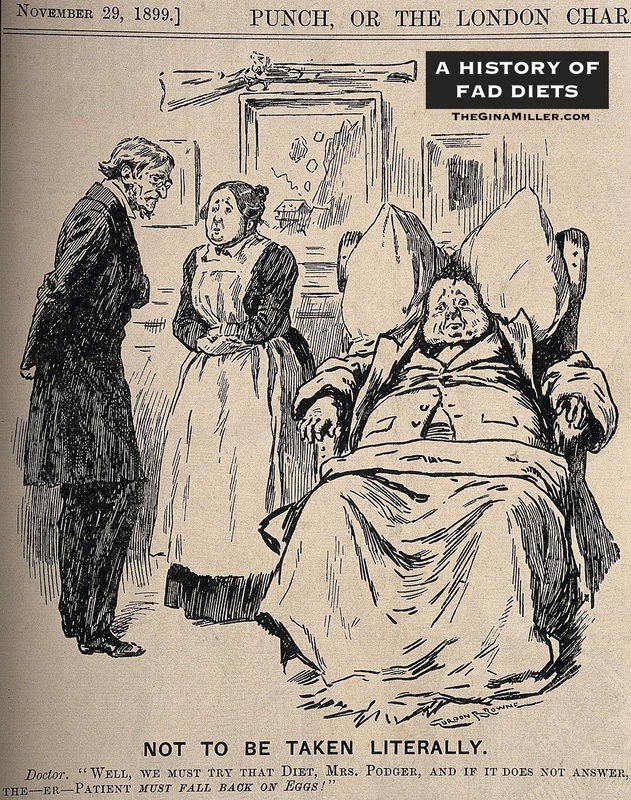 Since then fad diets have included eating all caribou and whale blubber (GAG), bananas and skim milk, food combining, the grapefruit diet and the Drinking Man's Diet (which is exactly what you think it is). They also include more popular ones like the Paleo Diet, the South Beach Diet and the Zone Diet. The thing is that many of these so-called "fad diets" don't work because it's almost impossible to adopt these habits permanently. Think about it: can you eat only grapefruit forever? Or caribou? Can you go Paleo in perpetuity? Probably not. You can do almost anything for a few days. That's why many of these fad diets take off initially. You drop a few pounds at the start and start feeling like a million bucks. Then, reality sets in and you realize you can't eat only skim milk and bananas or diet bars or cabbage soup for the rest of your life. That's why "diets" don't work. If you read this blog, you know how I feel about dieting: eat well, mostly real food (produce and lean meats), get moving most days of the week and enjoy it. That's a recipe for success. As for dietary approaches, I love the Mediterranean philosophy which emphasizes plant-based food, replaces butter with healthy fats like olive oil, uses herbs and spices to flavor foods, limits red meat, advocated red wine and dark chocolate in moderation. Have you experimented with fad diets? I would love to learn about your crazy diet experiences, what worked and what didn't. Please share your diet disasters and success stories in the comments section. Don't worry. This is a judgement-free zone. When I was fat, I tried the Zone & Atkins (hated them both). It wasn't until I made permanent changes, like closing the kitchen after dinner, that I experienced real weight loss. Want to learn how I did it? Get my free guide "The 10 Easiest Diet Tips: Simple Secrets To Help You Lose Weight & Maintain Your Weight Loss For Good". It's yours when you sign up for the The Real Skinny, my weekly newsletter that features simple diet and fitness tips designed for busy people who live in the real world, not fantasy-diet-land. Send Me The 10 Easiest Diet Tips!